The number of illegal immigrants crossing into the United States has surged since President Donald Trump signed an executive order ending the controversial policy of separating migrant children from their parents while the adult offenders await trial in immigration court. A Department of Homeland Security report showed a 38 percent increase among families entering the U.S. illegally from July to August. Overall, nearly 47,000 people were stopped at the Mexican border in August, up 17 percent from the month before. “These numbers are a result of our failure to do what is necessary to control the border,” said Mark Krikorian, executive director of the Center for Immigration Studies, in an interview with Fox News. An article published in the academic journal plos One, analyzing data from 1990 to 2016, calculated the number of illegal immigrants now living in the United States to be somewhere between 16 million and 29 million. This astounding figure is two to three times higher than most media outlets report. Demographers usually calculate the illegal population by subtracting the number of legal immigrants from the total foreign-born population, as identified in Census surveys. After the data is adjusted to reflect the likelihood that not every illegal immigrant is willing to fill out a Census form, the result is usually an illegal immigrant population of around 11 million people. Yale and mit researchers used a new method to conduct their plos One study. They searched government records to tally inflows of illegal immigrants from visa overstay and illegal border crossing, and outflows of illegal immigrants from emigration and death. Then they used mathematical models to assess the data. After running 1 million mathematical simulations, the researchers concluded that there are somewhere between 16 million and 29 million illegal immigrants in the nation—with the mean estimate of 22.1 million as the most likely figure. This data matches estimates that President Trump made in 2015, when he said the illegal immigrant population could be around 30 million. But it surprised the Yale researchers, who thought the number would be lower. If these new figures are correct, this means that 5 to 9 percent of the U.S. population is living in the country illegally. This is a huge problem for America’s economic well-being and security. 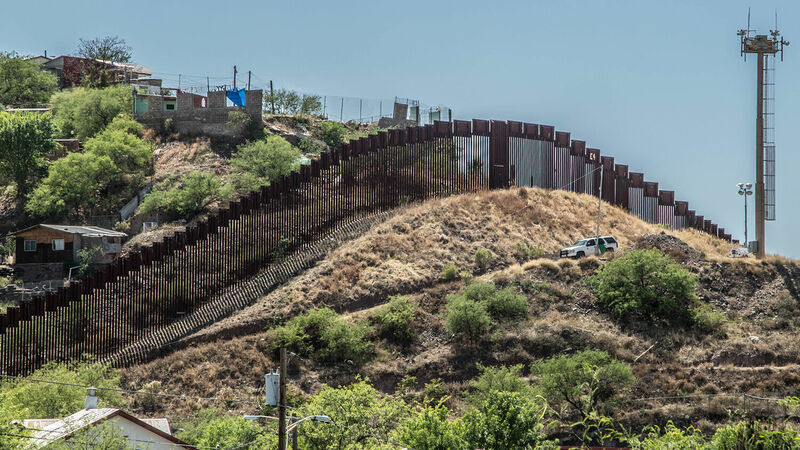 “Illegal aliens are pouring over the nation’s southern border by the tens of thousands, but our leaders refuse to stop the flow,” wrote editor in chief Gerald Flurry in the November 2014 issue of the Philadelphia Trumpet. Who are these immigrants? Many are women and children—but many are gang members, criminals and terrorists. As our border guards care for illegal minors, many violent enemies of America are easily crossing. At the same time, hostility from Latin America and the Hispanics within the U.S. intensifies. Dozens of biblical verses promise blessings to Israel for obedience to God’s law and warn of curses for disobedience. Herbert W. Armstrong explained in The United States and Britain in Prophecy that these verses apply primarily to the end-time descendants of ancient Israel, primarily the U.S. and Britain. In one prophecy, God says the United States will be besieged by foreign enemies: “The Lord shall bring a nation against thee from far, from the end of the earth, as swift as the eagle flieth; a nation whose tongue thou shalt not understand. … And he shall besiege thee in all thy gates, until thy high and fenced walls come down, wherein thou trustedst, throughout all thy land: and he shall besiege thee in all thy gates throughout all thy land, which the Lord thy God hath given thee” (Deuteronomy 28:49, 52). This reference to America’s “high and fenced walls” coming down is talking about open borders where foreigners flood into the land. Illegal immigrants are pouring into the country. Many on the radical left desire open borders, and the Trump administration seems powerless to stop the influx of illegal immigrants. This is because open borders are one of the curses God said He would send upon the U.S. if the people of the nation turned away from His law. The solution to the migrant crisis is not open borders. God lists open borders as a curse. Neither is the solution a border wall. God says that America’s “high and fenced wall” will come down. The solution is obedience to God’s laws. God promises that if His people “shalt hearken diligently unto the voice of the Lord,” then blessings shall come on them and overtake them (verses 1-2). For more information on where the migrant crisis is leading America, read Great Again, by Gerald Flurry.